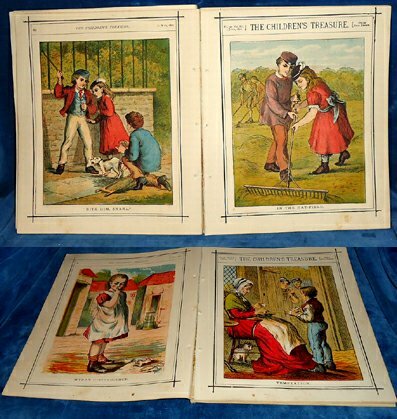 Description: London, Periodical (publisher unknown) 1872 Chromolith plate to beginning and end of each Monthly issue + black white line illustrations in the text. . Small quarto Ten monthly issues from Feb 1st 1872 starting with No.26. This publication started in 1870 and it ceased some time in 1873. Each monthly part was priced at one penny and contained 8 pages of moral stories, pictures and poems + the 2 coloured cover leaves. Our monthly parts were probably once bound up but are here sold as a group of monthly issues. Excellent coloured illustrations.